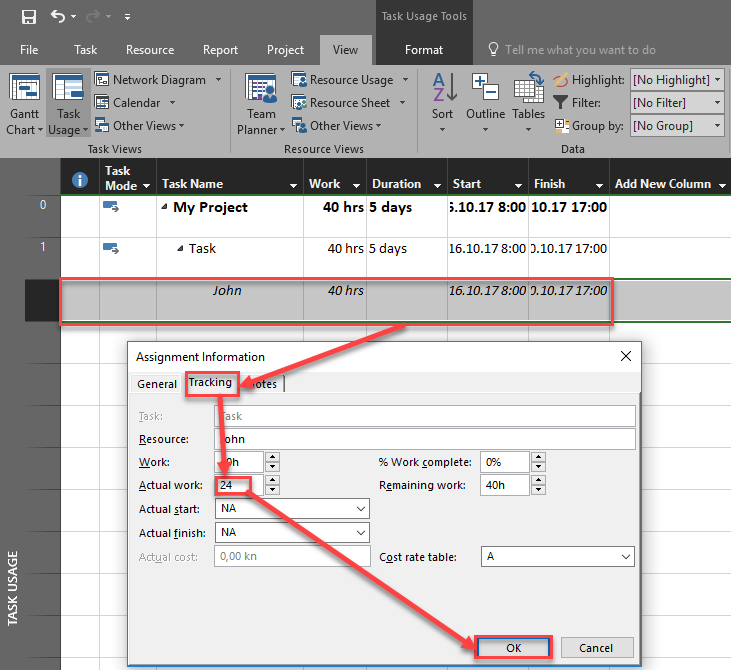 ← Overtime Work and Fixed Duration in MS PROJECT 2016! Today I’m going to explain what happens if I assign additional resource in Task which has a progress with MS PROJECT 2016. I will assign John to the Task. As you can see, Mary is assigned only at Thursday and Friday. Why? Is it a bug? No, it is not. It is great feature of Microsoft Project. Let me explain you why? Sin john had worked 8 hours per day for three days (from Monday to Wednesday), when I assign Mary to the Task, MS PROJT assumes that I want to add Mary only for the rest of work which should be done (at Thursday and Friday). But what, for xample, if I forgot to assign Mary to the Task at the very beginning? an i assign hr from Monday to Friday? Easy way to resolve a problem, isn’t it? This entry was posted in Microsoft Project 2013, MS PROJECT 2016, PMI and tagged Micorosft Project 2016, Micorosft Project 2016 - Resources, Micorosft Project 2016 - Tasks. Bookmark the permalink.